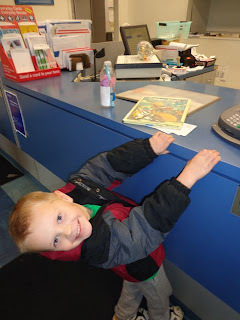 At the time when my son was around the age of three years old there were two picture books that he checked out from the library every time they were available. The first was I Stink by Kate McMullan and the other was Dinotrux by Chris Gall. The Dinotrux book was so well loved, by our family and many others, that our librarian decided it was time to discard it because of extensive wear. I was lucky enough to find this special book at the library's used book sale! This special book got even more special when I was able to have Chris Gall sign it for my son two summers ago at the Mazza Museum Summer Conference in Findlay, Ohio. I learned at the conference that Dinotrux was originally called "Truckasaurus" but shortly before the book was to be printed Chris Gall came across a Simpsons episode that made mention of a Truckasaurus so the title was changed to Dinotrux! 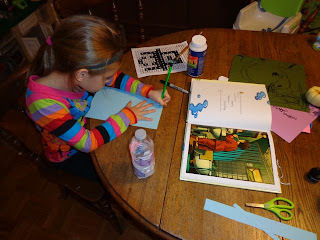 I really thought I was going to come up with a birthday celebration activity for Chris Gall using the book Dinotrux. However, it was Dear Fish, the first book Chris Gall both wrote and illustrated, that we really connected with this week. In this book, Peter Alan is visiting the beach with his family. He decides to invite the fish of the ocean over to his house by writing a note, placing it in a bottle, and casting it into the sea. Upon his return home, he finds that the fish -- even an octopus and whale -- have taken him up on his offer. The visit doesn't work out as Peter planned as the city didn't really have the capability of effectively accommodating all the fish from the ocean. However, it was an experience the fish and the Alan family will never forget. I loved that Peter Alan communicated with the fish by using a message in a bottle. 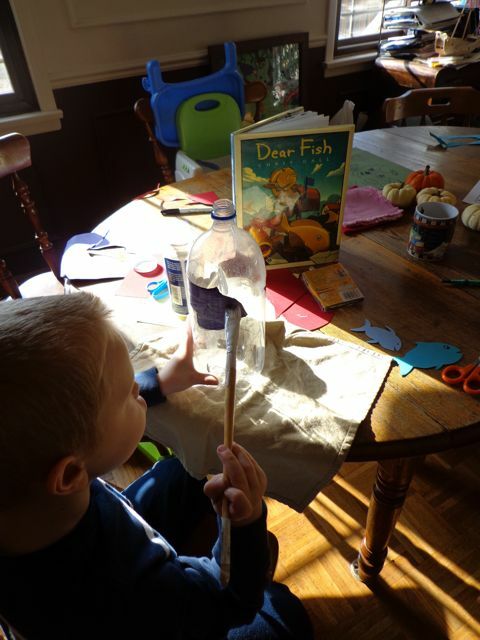 I thought it would be fun to bring this book to life by designing a bottle to send a message in the mail to our favorite cousins. We started our project by drawing our own fish on colored paper. 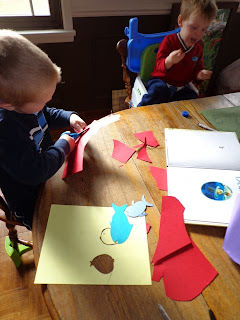 We made a total of five colored fish and cut them out. 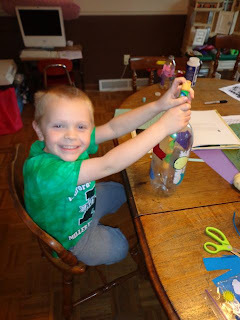 Then, my son decoupaged the fish onto a two-liter soda bottle. While the decoupage dried, my son chose to write a message to his cousin. He also included a drawing. We rolled it tight and applied stickers to make sure the message could be retrieved from the bottle once it arrived. I am always very pleased when my daughter comes home from school and gets excited about the projects we do during the day. She insisted on making her own message in a bottle. In her letter to her cousin she encouraged her to read Dear Fish because it has lots of "cool sound words". (i.e. crunching, slurping, gnawing, burping). She did such a nice job summarizing the book too. 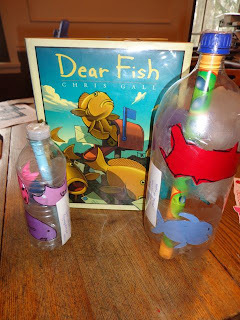 This would be a great school project -- summaries-in-a-bottle! 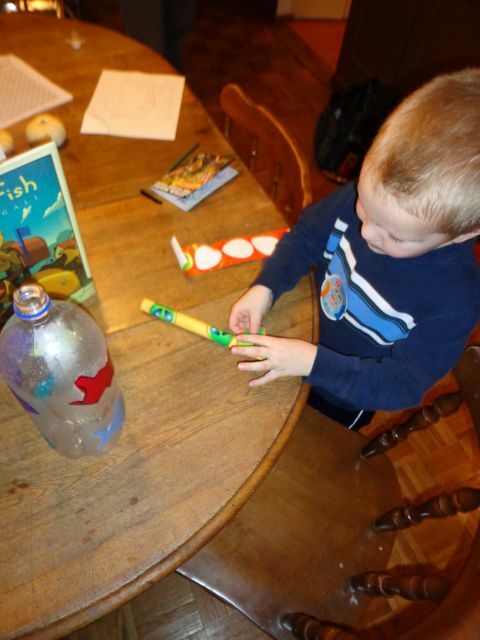 The next day my son placed his message inside the bottle and taped the lid shut. We also put a piece of clear packaging tape over the decoupaged fish just to make sure they didn't come off in transit. So, if you do not have decoupage you could just tape the fish on with clear packaging tape. The bottles were addressed and ready to go in the mail. Notice that my daughter used a standard water bottle for her message. We had the most helpful postal worker. She placed the postage stamp and barcode on the bottle taking care not to cover any of the fish! Both bottles shipped for the same price of $1.95 for first class mail service. Chris Gall has published six books for children including There's Nothing to Do on Mars and Substitute Creacher. 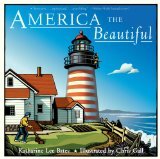 The first book that he published was America the Beautiful. Katharine Lee Bates, the author of the patriotic song, is Gall's great-great-grandaunt. Each of Gall's books feature his unique illustration style that Ann Brown of the Arizona Daily Star described as a "marrying of traditional engraving and technological artistry." Donna Kruetz of the University of Arizona described them as "fine-line engravings that are both fanciful and nostalgic," a technique he "developed while freelancing for the Tucson Weekly." Essentially, Gall sketches out his drawing with pencil, then etches it onto a piece of scratchboard, which is then scanned and colored in Photoshop. 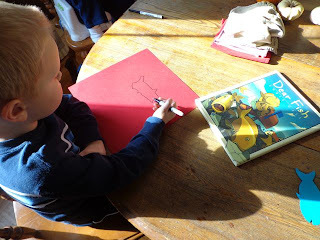 The bottom line is that his illustrations grab the attention of young readers! Eric, this is such a fun birthday party of sorts. I love the idea of mailing a message in a bottle. Wish I had thought of that when my kids were little. They would have loved that! Your reviews are always fun, and I love the videos you included.